What is a Bonsai Tree? Syzygium bonsai trees are evergreen and produce small flowers in late spring. They are very easy to prune, almost like topiary. 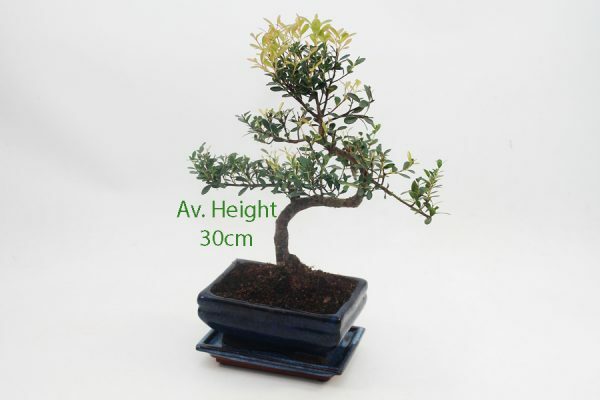 The bonsai you will receive will have a total height (tree & pot) of approximately 30cm. Please note that the tree pictured is a representative of the one which will be dispatched. We ALWAYS send the tree pictured unless stated here. This is a good choice for someone who has a conservatory, sunny porch or greenhouse. It can be kept indoors, in a bright but cool location. Outdoors is best in summer. Protect from heavy frost. If you have any questions or would like any help or advice please contact us by clicking here. For further details and to view our terms and conditions please click here. Price includes postage & packing excluding Highlands and Islands. We will simply send the tree and pot. The tree and a 250ml bottle of liquid bonsai fertiliser. There are instructions for use on the rear of the bottle. C – With Small Scissors. The tree and a pair of 120mm carbon steel bonsai scissors for light pruning. D – With Fertiliser & Small Scissors. The tree with fertiliser & small scissors as above. E – With Long Handled Scissors. The tree with 185mm pruning scissors which enable easier pruning. F – With Basic Gift Set. Our basic gift Set includes the tree, 250ml liquid bonsai fertiliser, 120mm pruning scissors and a drip tray, which may be a dark grey plastic or a ceramic tray which matches the pot colour if we have one available. G – With Regular Gift Set. Our regular gift set includes the tree, a 250ml bottle of bonsai fertiliser, a drip tray and a pair of 120mm long handled bonsai pruning scissors and a copy of The Bonsai Specialist book. H – With Superior Gift Set. Our superior gift set includes the tree, a 250ml bottle of bonsai fertiliser, a drip tray, a pair of 185mm long handled bonsai pruning scissors and a copy of The Bonsai Specialist book. I – With Premium Gift Set. Our premium gift set includes the tree, a 250ml bottle of bonsai fertiliser, a drip tray, 185mm long handled bonsai pruning scissors and a copy of The Bonsai Specialist book. It also include a bonsai wire cutter tool and 100g of bonsai wire in a range of sizes. J – With Stainless Gift Set. Our stainless gift set includes the tree, a 250ml bottle of bonsai fertiliser, a drip tray, top quality stainless steel pruning scissors and a copy of The Bonsai Specialist book. It also includes top quality stainless steel bonsai wire cutter tool and 100g of bonsai wire in a range of sizes. K – With 7 Piece Tool Kit. The tree with range of tools created specially for bonsai tree enthusiast. A great gift or tool set which will help you to make and care for bonsai trees. L – With Bonsai Encyclopedia. The tree with a copy of Bonsai by Dorling Kindersley. This book is 244 pages, full colour and covers a wide range of subjects relating to the art of bonsai. All our bonsai trees are hand selected to ensure that only the best trees with an individual character can be found for sale on our website. For customer service and general enquiries, we can be contacted via telephone on 07903 406 373.